Bracket Slides On Doors Up To 2-1/4"
Amid all your dorm supplies, seemingly every one can add some sort of decorative element to your dorm room. Your dorm bedding, for example, likely has a cool pattern and colorway. Even dorm organization products like this Flower 3 Hook - Over The Door Storage Decor look pretty cool! Why have regular hooks, when you can have a dorm room organizer that has flowers for hooks? When you're in your dorm room, don't just set your purse on top of your dorm bed. Hang it from these handy hooks. Toss up your shower towel and all matter of dorm stuff while you're at it. 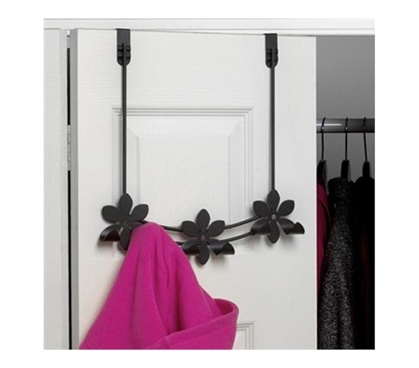 This over the door hook rack is built from solid steel; no matter how big your purse, don't worry about it bringing down those strong, yet still pretty little flowers. Storage and organizational space in college dorm rooms is nearly nonexistent, so college supplies like this floral hooks are really must have dorm items. In the colder months, for example, you'll need somewhere to hang your coat. Once again, throwing your school and dorm stuff all over your bed is messy, impractical, and a real annoyance when it comes time to get some sleep. Utilize all the space you're given and prevent a mess from forming with this college door hanger.